I’ve been wearing a DIY closed loop for something like 979 days..which means something like ~20,000 hours with this technology. Additionally, I’m not the only one. At the time of writing this post (see the latest count here), there are (n=1)*369+ (and that’s an undercount just based on who’s told us they’re looping) other DIYers out there, so the community has an estimated 1,800,000+ hours of cumulative experience, too. Suffice to say, we’ve all learned a lot about this technology and how hybrid closed loop makes a difference in life with diabetes. I previously gave a talk almost two years ago to the Sports & Diabetes Group Northwest here in Seattle, talking about #DIYPS, how we closed the loop, and #OpenAPS. (And you can see a recent TEDX talk I gave on OpenAPS here.) That was a springboard for meeting some awesome individuals who became very early DIY loopers in the Seattle area. And one of them (who also wore a pancreas at HIS wedding :)) had suggested we do another talk for SDGNW to update on some of what we have learned since then. But unfortunately, he got called out of town for work and couldn’t join me for presenting, so I went solo (ish, because Scott also came and contributed). I used a new analogy, because I think there’s a lot to think about before choosing and using closed loop technology, whether it’s DIY or commercial, and wanted to write it up for sharing here. First, some reminders for those familiar and some context for those who are not close to this technology. 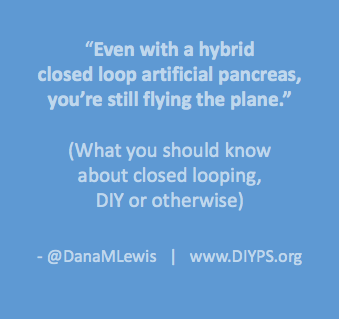 We’re talking about a hybrid closed loop, which is what I’m referring to when I say “artificial pancreas” or “AP” here. This type of technology makes small adjustments every few minutes to provide more or less insulin with the goal of keeping blood glucose (BG) levels in range. It’s complicated by the fact that insulin often peaks at 60-90 minutes…but food hits in ~15 minutes. So there’s often “catch up” being done with insulin to deal with food eaten previously, and also with hormones and other things that impact BGs that aren’t measurable. (This is also why it’s called hybrid, because for best outcomes people will still be doing some kind of meal announcement/bolus to deal with insulin timing.) As a result, even with pumps and CGMs, diabetes is still hard. A closed loop can do the needed math every five minutes, doesn’t go to sleep, and is very precise. It can respond more quickly (because it’s paying attention) than a human will in most situations, because we’re out living our lives/working/sleeping and not paying attention ONLY to diabetes. It’s not a cure, but it helps make living with diabetes better than it used to be. However, I equate it to being a pilot who has seen technology on planes evolve to include “autopilot”. 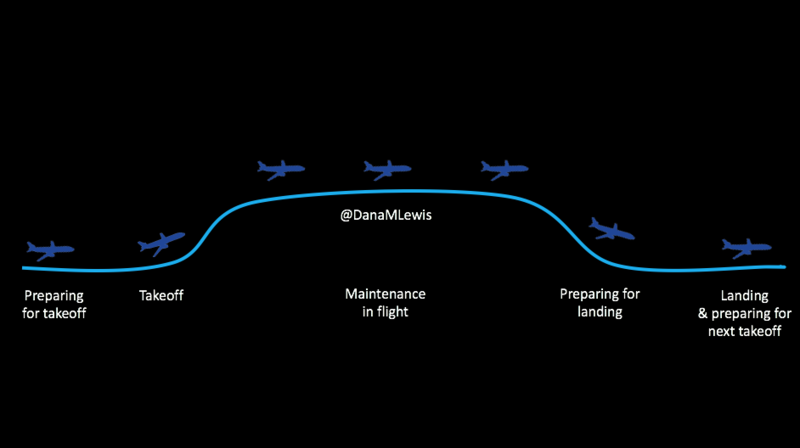 Even with hybrid closed loop technology, we’re still flying the “plane”. Here’s what I mean. There are stages for picking out and deciding to use the technology; preparing to use it/getting in the mode where you CAN use it; using it successfully; getting ready for the times when you can’t use it; and smoothing the way for the next time you use it. 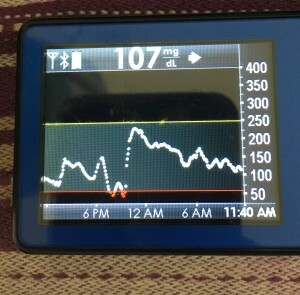 It’s not perfect 24/7, you see, because we’re still using pump sites and continuous glucose monitor (CGM) sensors. The CGM sensor may last for 7 days, but then you have to change it out (or cough restart it cough), and you have a gap in data, which means you can’t loop. 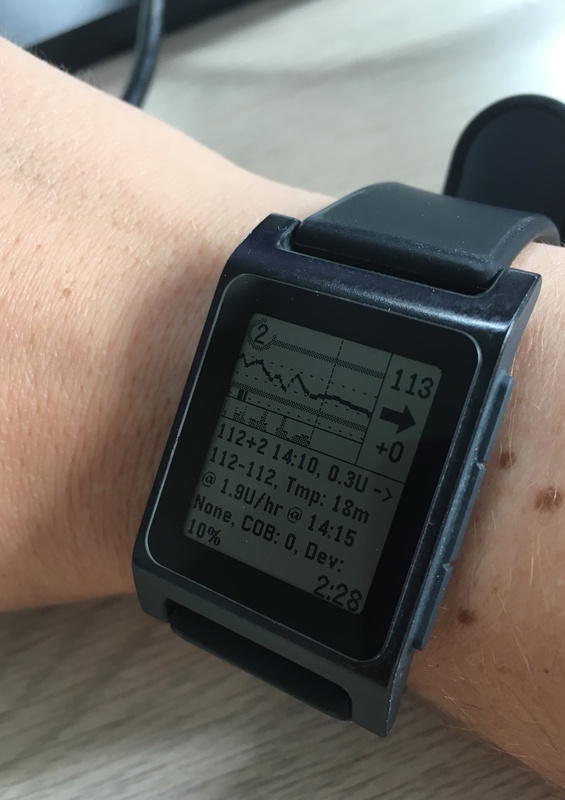 So you have this type of cycle regularly, and here’s what you need to know about each of these stages, regardless of whether we’re talking about DIY (like OpenAPS) or a commercial closed loop solution. When will your loop work? When does it not? What happens if it breaks? What are your back up tools? How do you operate it: what happens if your sensor loses data, or you don’t calibrate? How does the algorithm work? What will it target your BG to be? What behaviors will you have to do (meal bolus or announcement, etc.) and how can you alter those to optimize performance? Also, what are the warning signs of failure to let you know when you need to take additional action with corrective insulin or eating carbs? Communication errors between pieces of a system. Some of these are obvious fixes (put in a new sensor if one fell out, or decide to put in a new sensor if the old one is bad), but depending on the system may involve some troubleshooting to get things going again. Also, some of the commercial systems will kick you out of looping for various reasons (including lack of calibration), in addition to preventing you from looping in the first place without them, so knowing what these basic things are required for looping is useful to make sure you CAN automate. Some of these are basic behaviors you’ll be used to if you’ve been wearing a pump and CGM previously: keeping pump sites changed so the insulin works, and changing and calibrating CGM sensors. HOWEVER – many people who “stretch” their CGM sensors find that they don’t want to stretch their sensors as far, as the data degrades over time. You do you, but keep in mind this might change when you’re looping vs. not, because you’re relying on good data to operate the system. But if you keep your sites and sensors in good condition, this is where life is good. You’re looping! It’s microadjusting and helping keep things in range. Yay! This means better sleep, more time in range, and feeling better all around. However, you still have diabetes, you’re still in the plane, so you still need to keep an eye on things. Monitoring the system is important (to make sure you’re still in autopilot and don’t need to actually fly the plane manually), so make sure you know how you (and your loved ones) can monitor the system’s operation, and know what your backup alarms are in case of system failures. Note: there are approximately eleventy bajillion ways to remote monitor in DIY systems, but even if you have a commercial system that comes pre-baked without remote monitoring… you can add a DIY solution for that. So don’t feel like if you have a commercial AP that you can never use anything DIY – you can totally mix and match! What kind of airplane/flight analogy would this be without including turbulence? Like the things that can prevent looping in the first place, there are things that can throw off your looping. I already mentioned wonky sensor data that may mean either a blip in your looping time, or may kick you off looping. Again, your sensor life and your calibration practices will likely change. But the other big disturbance, so to speak, is around body sensitivity changes. You know all the ways it can happen: you’re getting sick, recovering from getting sick, getting ready for/or are on/or are right after your period, or have an adrenaline spike, or have hormones surging, or have a growth spurt, or just exercised, etc. You don’t want to go into exercise with a bucket of IOB, so set activity mode WELL BEFORE you go out for activity. Depending on how much netIOB you have, that time may vary, but planning ahead with an activity mode makes a big difference for not going low during activity – even with a closed loop. Your sensitivity may be impacted for hours afterward, into the next day. See above about having a system that can respond to sensitivity changes like that, but also think about having multiple targets you can use temporarily (if your system allows it) so you can give the system a bigger buffer while it sorts out your body’s sensitivity changes. Just like you’ll want to plan to go on the closed loop, you’ll want to plan for how to cycle off and then back on again. Depending on your system, there may be things you can do to smooth things out. One of the things I do is pre-soak a CGM sensor to skip the first day jumpy numbers. That makes a big difference for the first hours back on a “new” looping session. The other thing I do is stagger receiver start times (where I have two receivers that I stop/start at different times, so I’m not stuck for two hours without BG data to loop on). But even if you can’t do that, you can do some other general planning ahead – like making sure your looping session doesn’t end in the middle of a big meal that’s being digested, or overnight. Those are the times when you’ll want to be looping the most. Picking one kind of technology does NOT lock you into it forever. If you’re DIYing now, you can choose commercial later. If you start on a commercial system, you can still try a DIY system. Don’t compare the original iPhone with an iPhone 6. Let’s be blunt: the Dexcom 7plus is a different beast than the Dexcom G4/G5. Similarly, Medtronic’s original “harpoon” sensor is different than their newest sensor tech. The Abbott Navigator is different than their Libre. Don’t be held up by perceptions of the old tech – make sure to check out the new stuff with a somewhat open mind. All systems (both DIY and commercial) have pros and cons. They also each will have their own learning curves. Some of that learning is generalized, and will translate between systems. But again, iPhone to Android or vice versa – your cheese gets moved and there will be learning to do if you switch systems. Remember, everyone learns differently – and everyone’s diabetes is different. Figure out what works well for you, and rock it! I had the awesome opportunity to present at #AADE17, the annual education meeting for the American Association of Diabetes Educators, this past weekend. My topic was about OpenAPS and DIY diabetes… which really translates to some broader things I want all educators and HCPs to know about patients and technology, whether it’s DIY or just unknown to them. Unfortunately AADE didn’t record or livestream my session, so I wanted to write up a summary of the content here. Diabetes is hard. Even if you are privileged to have access to insulin, education, and technology – it can still be so incredibly hard to get it right. And even if you do everything “right”, the outcomes will still vary. And after all, the devices themselves are not perfect, and we still have diabetes. The lack of varying alarms and the unchangeable volume is what led me to create DIYPS (my open loop and louder alarm system), and the same frustration with lack of data access and visualization led John Costik, Lane Desborough, Ben West, and so many others to explore creating other DIY tools, such as Nightscout. And thanks to social media, we all didn’t have to create in a vacuum: we can share code (this is what open source means) and insight through social media, and build upon each other’s work. As a result, these collaborations, sharing, and iterative development is how OpenAPS, the open source artificial pancreas system movement, was created. I tweet and talk and share frequently about how great it is having #OpenAPS in my life. Norovirus? No problem. Changes in sensitivity due to exercise? Not the biggie it used to be. In some cases, we humans know more than the technology: such as when a meal is going to happen/is coming, and when exercise is going to happen. So it’s nice to be able to interoperate your devices and be able to use your phone, watch, computer, etc. to be able to tell the system what to do differently (i.e. set higher targets in the case of activity, or lower targets to achieve “eating soon” mode , or in the case of waking up). But in a LOT of cases, it’s tiring for the human to have to think about all the things. Such as whether a pump site is slowly dying and causing apparent insulin resistant. Or such as when you’re more sensitive 12-24 hours after exercise. Or during menstrual cycles. Or when sick. Or during a growth spurt. Or during jet lag. Or during a trip where you can’t find anything to eat. Etc. It’s a lot for us PWD’s to track, and this is where computers come in handy. 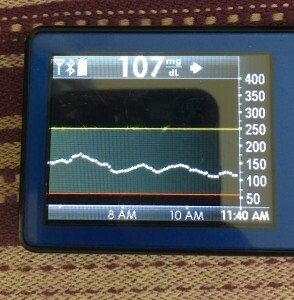 Things like autosensitivity in OpenAPS to automatically detect changes in sensitivity and adjust the variables for calculations automatically; and autotune, to track the data of what’s actually happening and make recommendations for changing your underlying pump settings (ISF, carb ratio, and basal rates). And how has this technology been developed by patients? Iteratively, as we figure out what’s possible. It’s not about boiling the ocean; it’s about approaching problems bit by bit as we have new tools to solve them, or new people with energy to think about the problem in different ways. It’s like thinking about getting a car – you wouldn’t expect the manufacturer to sell bits and pieces of the car frame, and you don’t really expect medical device manufacturers to sell bits and pieces of a pump or other device. However, patients are closest to the REAL problems in living with diabetes. Instead of a “car”, they’re looking for solutions for getting from point A to point B. And so in the car analogy, that means starting with a skateboard, scooter, or bike – and ending up with a car is great, but the car is not the point. So no, any piece of technology isn’t going to be a cure or solve all problems or work perfectly for everyone. But that is true whether it’s DIY or a commercial tool: one size certainly does not fit all. And patients are individuals with their own lives and their own challenges with diabetes, with different motivations around what aspects of life with diabetes feel like friction and what they feel equipped to tackle and solve. Yes, DIY tech is often off label. But that’s ok – it just means it’s off label; it doesn’t prevent you from listening to why patients are using it, what we think it’s doing for us, and it doesn’t prevent you from asking questions, learning more, or still advising patients. You get to take advantage of the opportunity when someone brings something new into the office – it’s probably the first of many times you’ll see it, and the first patient is often on the bleeding edge and deeply engaged and understands what they’re using, and open to sharing what they’ve learned to help you, so you can also help other patients! You also get to take advantage of the open source community. It’s open, not just for patients to use, but for companies, and for CDEs and other HCPs as well. There are dozens if not hundreds of active people on Twitter, Facebook, blogs, forums, and more who are happy to answer questions and help give perspective and insight into why/how/what things are. Don’t forget – many of the DIY tools provide data and insight that currently don’t exist in any traditional and/or commercially and/or FDA-approved tool. Take autotune for example – there’s nothing else out there that we know of that will tune basal rates, ISF, and carb ratio for people with pumps. And the ability of tools like Nightscout reports to show data from a patient’s disparate devices is also incredibly helpful for healthcare providers and educators to use to help patients. And one final point specific to hybrid closed loop technology: this technology is going to solve a lot of problems and frustrations. But, it may mean that patients will shift the prioritization of other quality of life factors like ease of use over older, traditionally learned diabetes behaviors. This means things like precise carb counting may go by the wayside for general meal size estimations, because the technology yields similar outcomes. Being aware of this will be important for when CDE’s are working with patients; knowing what the patterns of behaviors are and knowing where a patient has shifted their choices will be helpful for identifying what behaviors can be adapted to yield different outcomes. I think the increase in technology (especially various types of closed loops, DIY and commercial) will yield MORE work for CDE’s and HCP’s, rather than less. This means it’s even more important for them to get up to speed on current and evolving technology – because it’s by no means going away. And the first wave of DIY’ers have a lot we can share and teach not just other patients, but also CDE’s. So again, many thanks to AADE for the opportunity to share some of this perspective at #AADE17, and thanks to everyone for the engagement during and after the session! It’s fascinating how bodies adapt to changing situations. For those of us with diabetes: do you remember the first time you took insulin after diagnosis? For me, I had been fasting for ~18 hours (because I felt so bad, and hadn’t eaten anything since dinner the night before) and drinking water, and my BG was still somehow 550+ at the endo’s office. Water did nothing for my unquenchable thirst, but that first shot of insulin first sure did. I still remember the vivid feeling of it being an internal liquid hydration for my body, and everything feeling SO different when it started kicking in. In case the BG of 550+, the A1c of 14+ (don’t remember exact number), and me feeling terrible for weeks wasn’t enough, that’s one of the things that really reinforced that I have diabetes and insulin is something my body desperately needs but wasn’t getting. Over the last ~14+ years, I’ve had a handful of times that reinforced the feeling of being dependent on this life-saving drug, and the drastic difference I feel with and without it. Usually, it’s been times where a pump site ripped out, or I was sick and high and highly resistant, and then finally stopped being as resistant and my blood sugar started responding to insulin finally after hours of being really high, and I started dropping. 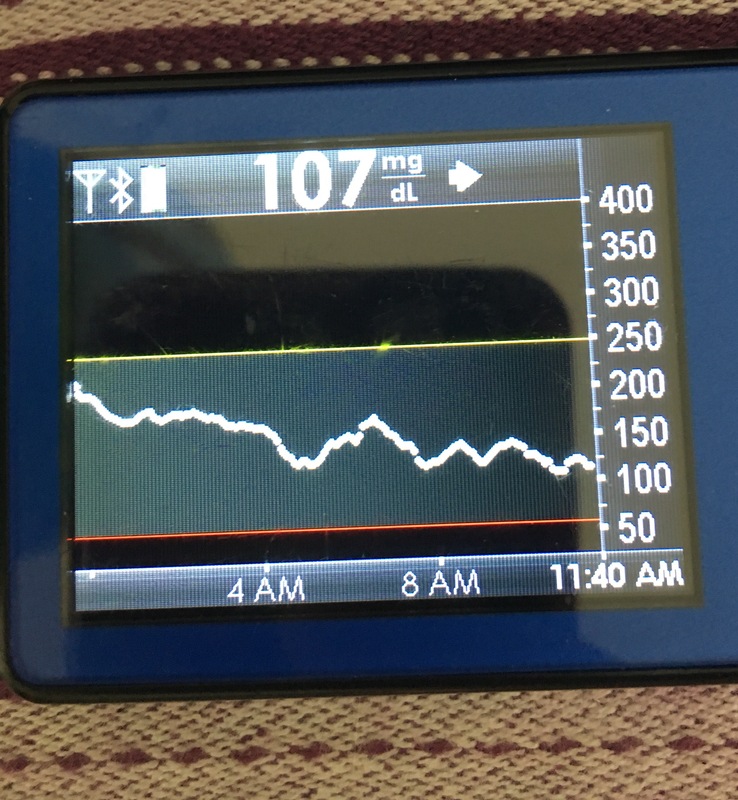 But I’ve had different ways to experience this feeling lately, as a result of having live with a DIY closed loop (OpenAPS) for 2+ years – and it hasn’t involved anything drastic as a HIGH BG or equipment failure. It’s a result of my body re-calibrating to the new norm of my body being able to spend more and more time close to 100% in range, in a much tighter and lower range than I ever thought possible (especially now true with some of the flexibility and freedom oref1 now offers). I originally had a brief fleeting thought about how BGs in the low 200s used to feel like the 300s did. Then, I realized that 180 felt “high”. One day, it was 160. 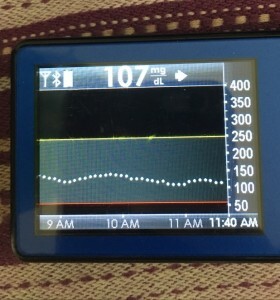 Then one day, my CGM said flat in 120s and I felt “high”. (I calibrated, and turned out that it was really 140). I’ve had several other days where I’d hit 140s and feel like I used to do in the mid-200s (slightly high, and annoying, but no major high symptoms like 300-400 would cause – just enough to feel it and be annoyed). 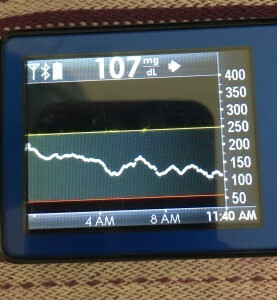 That was odd enough as a fleeting thought, but it was really odd to wake up one morning and without even looking at my watch or CGM to see what my BGs had been all night, know that I had been running high. I further classified “really odd” as “completely crazy” when that “running high” meant floating around the 130-140 range, instead of down in the 90-110 range, which is where I probably spend 95% of my nights nowadays. Last night is what triggered this blog post, plus a recurring observation that because I have a DIY closed loop that does so well at handling the small, unknown variances that cause disturbances in BG levels without me having to do much work, that as result it is MUCH easier to pinpoint major influences, like my liver dumping glucose (either because of a low or because it’s ‘full up’ and needs to get rid of the excess). In last night’s case, it was a major liver dump of glucose. Scott and I went on a long walk, with the plan to stop for dinner on the way home. BG started dropping as I was about half a mile out from the restaurant, but I’m stubborn 😀 and didn’t want to eat a fruit strip when I was about to sit down an eat a burger. So, my BG was dropping low when I actually ate. I expected my BG to flatten on its own, given the pause in activity, so I bolused fairly normally for my burger, and we walked the last .5 miles home. However, I ended up not rising from the burger like I usually do, and started dropping again. It was quite a drop, and I realize my burger digestion was different because of the previous low, so I ended up eating some fruit to handle the second low. My body was unhappy at two lows, and so my liver decided to save the day by dumping a bunch of glucose to help bring my blood sugar up. Double rebound effect, then, from the liver dump and the fruit I had eaten. Oh well, that’s what a closed loop is for! Instead of rebounding into the high 300s (which I would have expected pre-closed loop), I maxed out at 220. The closed loop did a good job of bolusing on the way up. However, because of how much glucose my liver dumped, I stayed higher longer. (Again, this probably sounds crazy to anyone not looping, as it would have sounded to me before I began looping). I sat around 180 for the first three hours of the night, and then dropped down to ~160 for most of the rest of the night, and ended up waking up around 130. And boy, did I know I had been high all night. I felt (and still feel, hours later) like I used to years ago when I would wake up in the 300s (or higher). Hmm, 3 hours doesn’t look so bad despite feeling it. 6 hour view shows why I feel it. 24 hours shows you the full view of the double low and why my liver decided I needed some help. Thanks, liver, for still being able to help if I really needed it! Settling back to normal below 120, hours later. There are SO many amazing things about DIY closed looping. Better A1c, better average BG, better time in range, less effort, less work, less worrying, more sleep, more time living your life. One of the benefits, though, is this bit of double-edged sword: your body also re-calibrates to the new “normal”, and that means the occasional extreme BG excursion (even if not that extreme!) may give you a different range of symptoms than you used to experience. If you give a mouse a cookie or give a patient their data, great things will happen. First, it was louder CGM alarms and predictive alerts (#DIYPS). Next, it was a basic hybrid closed loop artificial pancreas that we open sourced so other people could build one if they wanted to (#OpenAPS, with the oref0 basic algorithm). 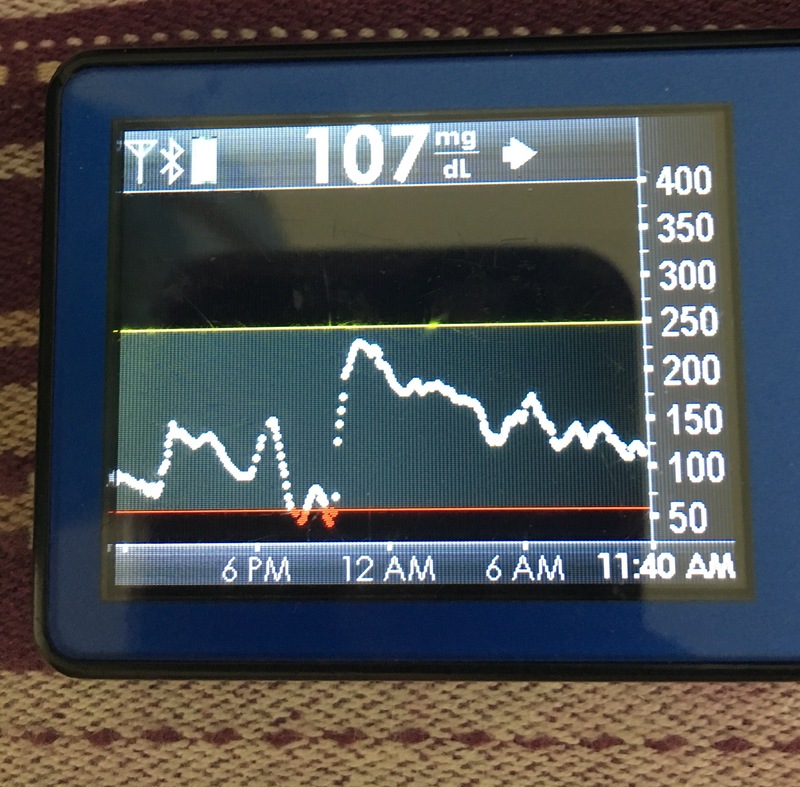 Then, it was all kinds of nifty lessons learned about timing insulin activity optimally (do eating soon mode around an hour before a meal) and how to use things like IFTTT integration to squash even the tiniest (like from 100mg/dL to 140mg/dL) predictable rises. It was also things like displays, button, widgets on the devices of my choice – ranging from being able to “text” my pancreas, to a swipe and button tap on my phone, to a button press on my watch – not to mention tinier sized pancreases that fit in or clip easily to a pocket. Then it was autosensitivity that enabled the system to adjust to my changing circumstances (like getting a norovirus), plus autotune to make sure my baseline pump settings were where they needed to be. And now, it’s oref1 features that enable me to make different choices at every meal depending on the social situation and what I feel like doing, while still getting good outcomes. Actually, not good outcomes. GREAT outcomes. With oref0 and OpenAPS, I’d been getting good or really good outcomes for 2 years. But it wasn’t perfect – I wasn’t routinely getting 100% time in range with lower end of the range BG for a 24hour average. ~90% time in range was more common. (Note – this time in range is generally calculated with 80-160mg/dL. I could easily “get” higher time in range with an 80-180 mg/dL target, or a lot higher also with a 70-170mg/dL target, but 80-160mg/dL was what I was actually shooting for, so that’s what I calculate for me personally). I was fairly happy with my average BGs, but they could have been slightly better. I wrote from a general perspective this week about being able to “choose one” thing to give up. And oref1 is a definite game changer for this. It’s being able to put in a carb estimate and do a single, partial bolus, and see your BG go from 90 to peaking out at 130 mg/dL despite a large carb (and pure ballpark estimate) meal. And no later rise or drop, either. It’s now seeing multiple days a week with 24 hour average BGs a full ~10 or so points lower than you’re used to regularly seeing – and multiple days in a week with full 100% time in range (for 80-160mg/dL), and otherwise being really darn close to 100% way more often than I’ve been before. But I have to tell you – seeing is believing, even more than the numbers show. I remember in the early days of #DIYPS and #OpenAPS, there were a lot of people saying “well, that’s you”. But it’s not just me. See Tim’s take on “changing the habits of a lifetime“. See Katie’s parent perspective on how much her interactions/interventions have lessened on a daily basis when testing SMB. I was pretty happy with my 5.8% from a couple months of SMB, which has included the 2 worst months of eating habits in years. It almost feels like a break from diabetes, even though I’m still checking hourly to make sure everything is connected and working etc and periodically glancing to see if I need to do anything. So much of the burden of tight control has been lifted, and I can’t even do a decent job explaining the feeling to family. We used to battle 220s at this time of day (showing a picture flat at 109). Four basal rates in morning. Extra bolus while leaving house. Several text messages before second class of day would be over. Crazy amount of work [in the morning]. Now I just have to brush my teeth. I don’t know if I’ve ever gone 24 hours without ANY mention of something that was because of diabetes to (my child). Thank you to everyone who keeps paying it forward to help others, and to all of you who share your stories and feedback to help and encourage us to keep making things better for everyone. What do you have to do today (related to daily insulin dosing for diabetes) that you’d like to give up if you could? Counting carbs? Bolusing? Or what about outcomes – what if you could give up going low after a meal? Or reduce the amount that you spike? How many of these 5 things do you think are possible to achieve together? How many can you manage with your current therapy and tools of choice? How many do you think will be possible with hybrid closed loop systems? Please think about (and maybe even write down) your answers before reading further to get our perspective. With just pump and CGM, it’s possible to get good time in range with proper boluses, counting carbs, and eating relatively low-carb (or getting lucky/spending a lot of time learning how to time your insulin with regular meals). Even with all that, some people still go low/have hypoglycemia. So, let’s call that a 2 (out of 5) that can be achieved simultaneously. 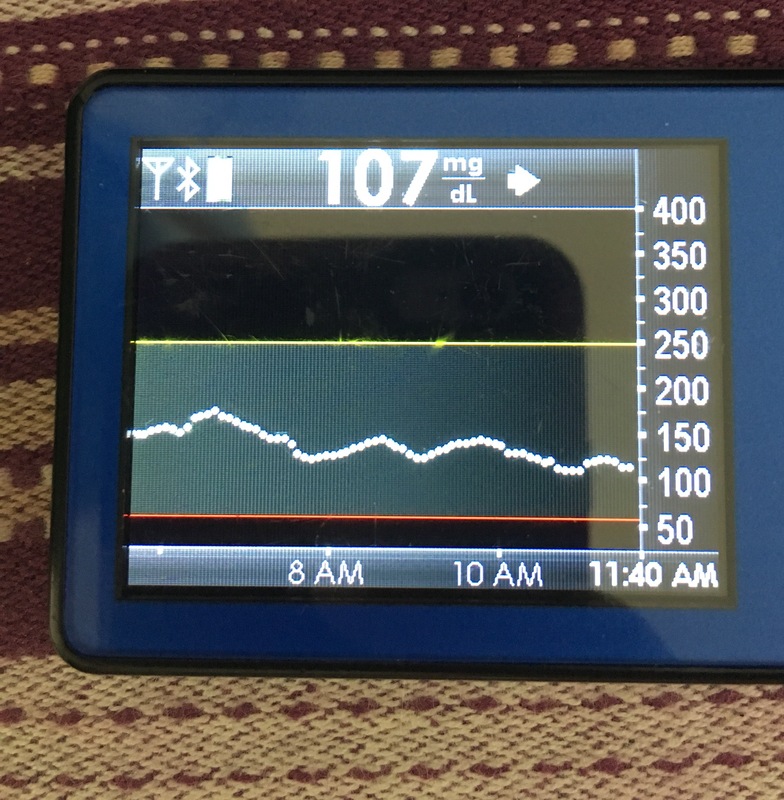 With a first-generation hybrid closed loop system like the original OpenAPS oref0 algorithm, it’s possible to get good time in range overnight, but achieve that for meal times would still require bolusing properly and counting carbs. But with the perfect night-time BGs, it’s possible to achieve no-hypoglycemia and 80% time in range with medium carb meals (and high-carb meals with Eating Soon mode etc.). So, let’s call that a 3 (out of 5). With some of the advanced features we added to OpenAPS with oref0 (like advanced meal assist or “AMA” as we call it), it became a lot easier to achieve a 3 with less bolusing and less need to precisely count carbs. It also deals better with high-carb meals, and gives the user even more flexibility. So, let’s call that a 3.5. A few months ago, when we began discussing how to further improve daily outcomes, we also began to discuss the idea of how to better deal with unannounced meals. This means when someone eats and boluses, but doesn’t enter carbs. (Or in some cases: eats, doesn’t enter carbs, and doesn’t even bolus). How do we design to better help in that safety, all while sticking to our safety principles and dosing safely? With a low-carb meal, no-hypoglycemia and 80+% time in range is achievable without bolusing or counting carbs (with just an Eating Soon mode that triggers SMB). 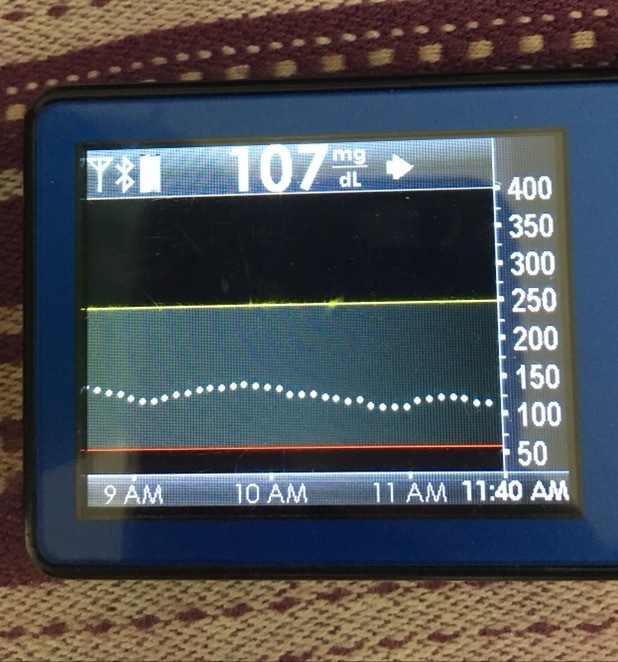 With a regular meal, the user can either bolus for it (triggering floating carb UAM with SMB) or enter a rough carb count / meal announcement (triggering Eating Now SMB) and achieve 80% time in range. If the user chooses to eat a regular meal and not bolus or enter a carb count (just an Eating Soon mode), the BG results won’t be as good, but oref1 will still handle it gracefully and bring BG back down without causing any hypoglycemia or extended hyperglycemia. That is huge progress, of course. And we think that might be about as good as it’s possible to do with current-generation insulin-only pump therapy. To do better, we’d either need an APS that can dose glucagon and be configured for tight targets, or much faster insulin. The dual-hormone systems currently in development are targeting an average BG of 140, or an A1c of 6.5, which likely means >20% of time spent > 160mg/dL. And to achieve that, they do require meal announcements of the small/medium/large variety, similar to what oref1 needs. Fiasp is promising on the faster-insulin front, and might allow us to develop a future version of oref1 that could deal with completely unannounced and un-bolused meals, but it’s probably not fast enough to achieve 80% time in range on a high-carb diet without some sort of meal announcement or boluses. But 4 out of 5 isn’t bad, especially when you get to pick which 4, and can pick differently for every meal. Does that make OpenAPS a “real” artificial pancreas? Is it a hybrid closed loop artificial insulin delivery system? Do we care what it’s called? For Scott and me; the answer is no: instead of focusing on what it’s called, let’s focus on how different tools and techniques work, and what we can do to continue to improve them. Today I built (another) new (really tiny) tool to make it easier for people using OpenAPS rigs to continually update and improve their tools. Woohoo! When we switched last year to using the “setup scripts” for OpenAPS, this became the tool for setting up new, advanced features like Advanced Meal Assist, Autosensitivity, Autotune, and other things. Which means that people were running the setup scripts multiple times. It wasn’t bad, because we built in an interactive setup guide to walk people through the process to select which features they did or did not want. But, it took a bit of time to do, and upon your 8th (or 80th) run of the setup script, especially for those of us developing the script, it got tiring. So we decided to automate some output, that could be copied and pasted to speed up running the same set of options on the command line the next time. Many people, however, in their first setup run-through don’t see that, or don’t remember to copy and paste it. Last night, it occurred to me that I should add a more explicit note to the docs for people to stop and copy and paste it. But then I had an idea – what if we could stash away the content in another file, so you could find it anytime without having to run the setup script interactively? Lightbulb. So today, I sat down and gave it a stab. It’s simple-ish code being added in (now in dev branch of oref0; docs for it here), but it will save little bits of time that over time add up to a lot of time saved. This is how almost all of the iterative OpenAPS development occurs: we repeat something enough times, decide it needs to be automated, and find a way to make it happen. And that’s how the tools and code and documentation continues to get to be better and better! What if, instead of guessing needed changes (the current most used method) basal rates, ISF, and carb ratios…we could use data to empirically determine how these ratios should be adjusted? Historically, most people have guessed basal rates, ISF, and carb ratios. Their doctors may use things like the “rule of 1500” or “1800” or body weight. But, that’s all a general starting place. Over time, people have to manually tweak these underlying basals and ratios in order to best live life with type 1 diabetes. It’s hard to do this manually, and know if you’re overcompensating with meal boluses (aka an incorrect carb ratio) for basal, or over-basaling to compensate for meal times or an incorrect ISF. And why do these values matter? It’s not just about manually dosing with this information. But importantly, for most DIY closed loops (like #OpenAPS), dose adjustments are made based on the underlying basals, ISF, and carb ratio. For someone with reasonably tuned basals and ratios, that’s works great. But for someone with values that are way off, it means the system can’t help them adjust as much as someone with well-tuned values. It’ll still help, but it’ll be a fraction as powerful as it could be for that person. With autosensitivity, we were able to start to assess when actual BG deltas were off compared to what the system predicted should be happening. And with that assessment, it would dynamically adjust ISF, basals, and targets to adjust. However, a common reaction was people seeing the autosens result (based on 24 hours data) and assume that mean that their underlying ISF/basal should be changed. But that’s not the case for two reasons. First, a 24 hour period shouldn’t be what determines those changes. Second, with autosens we cannot tell apart the effects of basals vs. the effect of ISF. 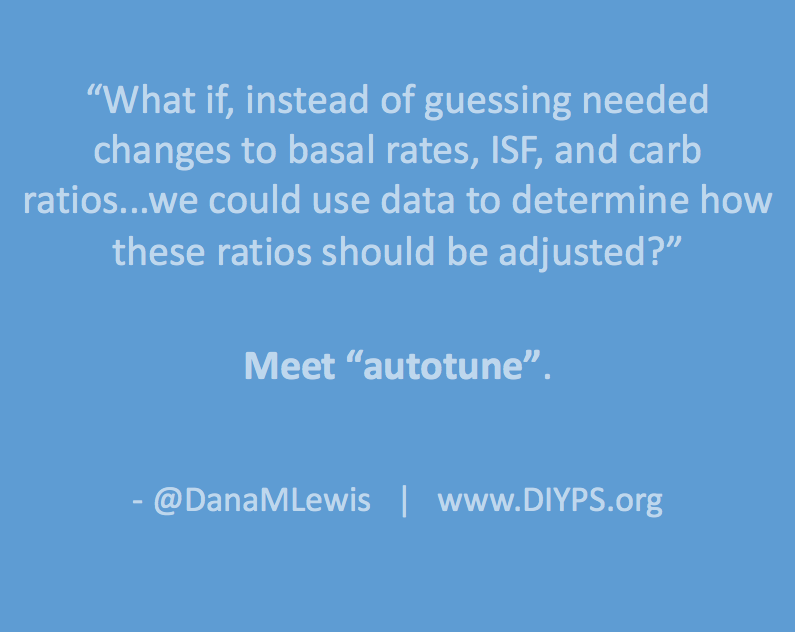 Autotune, by contrast, is designed to iteratively adjust basals, ISF, and carb ratio over the course of weeks – based on a longer stretch of data. 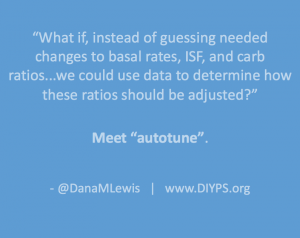 Because it makes changes more slowly than autosens, autotune ends up drawing on a larger pool of data, and is therefore able to differentiate whether and how basals and/or ISF need to be adjusted, and also whether carb ratio needs to be changed. Whereas we don’t recommend changing basals or ISF based on the output of autosens (because it’s only looking at 24h of data, and can’t tell apart the effects of basals vs. the effect of ISF), autotune is intended to be used to help guide basal, ISF, and carb ratio changes because it’s tracking trends over a large period of time. Ideally, for those of us using DIY closed loops like OpenAPS, you can run autotune iteratively inside the closed loop, and let it tune basals, ISF, and carb ratio nightly and use those updated settings automatically. Like autosens, and everything else in OpenAPS, there are safety caps. Therefore, none of these parameters can be tuned beyond 20-30% from the underlying pump values. If someone’s autotune keeps recommending the maximum (20% more resistant, or 30% more sensitive) change over time, then it’s worth a conversation with their doctor about whether your underlying values need changing on the pump – and the person can take this report in to start the discussion. And from what we know, this may be the first tool to help actually make data-driven recommendations on how to change basal rates, ISF, and carb ratios. To determine if a “datum” is attributable to CSF, carbs on board (COB) are calculated and decayed over time based on observed BGI deviations, using the same algorithm used by Advanced Meal Asssit. Glucose values after carb entry are attributed to CSF until COB = 0 and BGI deviation <= 0. Subsequent data is attributed as ISF or basals. If BGI is positive (meaning insulin activity is negative), BGI is smaller than 1/4 of basal BGI, or average delta is positive, that data is attributed to basals. Otherwise, the data is attributed to ISF. All this data is output to a single file with 3 sections: ISF, CSF, and basals. Autotune-core reads the prepped glucose file with 3 sections. 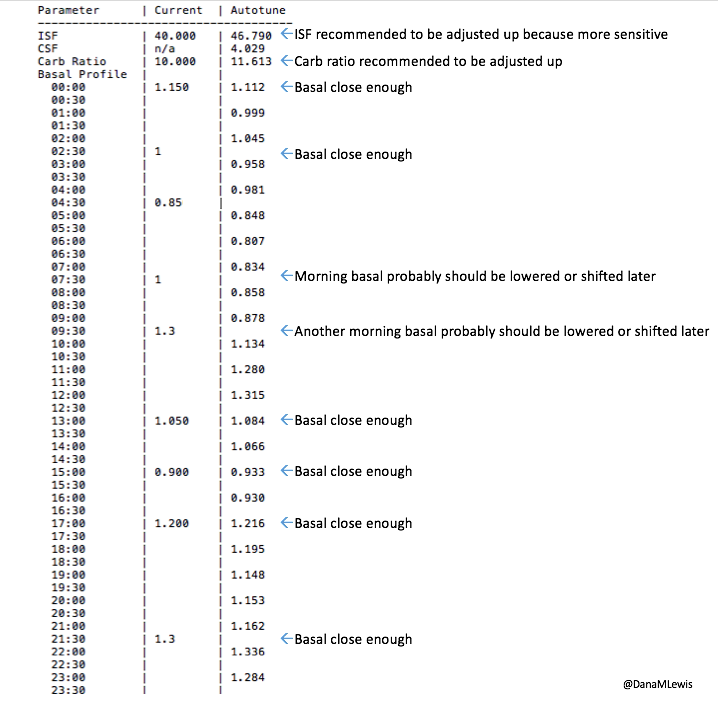 It calculates what adjustments should be made to ISF, CSF, and basals accordingly. For basals, it divides the day into hour long increments. It calculates the total deviations for that hour increment and calculates what change in basal would be required to adjust those deviations to 0. It then applies 20% of that change needed to the three hours prior (because of insulin impact time). If increasing basal, it increases each of the 3 hour increments by the same amount. If decreasing basal, it does so proportionally, so the biggest basal is reduced the most. For ISF, it calculates the 50th percentile deviation for the entire day and determines how much ISF would need to change to get that deviation to 0. It applies 10% of that as an adjustment to ISF. For CSF, it calculates the total deviations over all of the day’s mealtimes and compares to the deviations that are expected based on existing CSF and the known amount of carbs entered, and applies 10% of that adjustment to CSF. Autotune applies a 20% limit on how much a given basal, or ISF or CSF, can vary from what is in the existing pump profile, so that if it’s running as part of your loop, autotune can’t get too far off without a chance for a human to review the changes. Here’s an example of autotune output. Autotune is one of the things Scott and I spent time on over the holidays (and hinted about at the end of my development review of 2016 for OpenAPS). As always with #OpenAPS, it’s awesome to take an idea, get it coded up, get it tested with some early adopters/other developers within days, and continue to improve it! A big thank you to those who’ve been testing and helping iterate on autotune (and of course, all other things OpenAPS). It’s currently in the dev branch of oref0 for anyone who wants to try it out, either one-off or for part of their dev loop. Documentation is currently here, and this is the issue in Github for logging feedback/input, along with sharing and asking questions as always in Gitter!